The great sport of Ranch Sorting is exploding all across the US and we at the RSNC couldn’t be more excited. We are now 23,000 members strong with over 500 shows booked for the season. Our National Finals had over 6,700 teams this year! 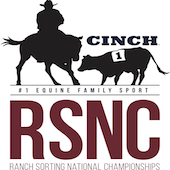 What is Ranch Sorting National Championships (RSNC) ? RSNC was formally established in the Spring of 2007 by horse enthusiasts who compete and participate in different equine events and see its potential within the equine industry. Our goal is to grow the sport to the largest equine sport membership in the nation. RSNC is helping contestants as a unified force to grow this sport, through exposure and national equine publications and media such as RFD-TV and Horse TV. We offer easy access to exciting competition for beginners, right up to the expert. 75% of all the competitors coming to RSNC events are new to horse sport competitions. It’s so easy anyone who can throw a leg over a horse can have FUN and compete. This is the only equine sport in the nation that allows everyone in the family to COMPETE, WIN and get the recognition and rewards that in most equine sports only the very top competitors receive. What are the benefits of RSNC membership? Why are RSNC events so popular? Any person that can ride a horse can be competitive in RSNC ranch sorting. The RSNC 9 point rating sys tem, combined with the handicapping system, levels the playing field. That way ALL participants have a fair chance to WIN! The handicapping system encourages the teaming of skilled sorters with the less-experience partners while the Masters classes feed the appetite of the mature competitor. Beginners, Youth and the Rookies get a piece of the spotlight as well. When it says $25 entry fee on the show flyer is that per rider or team? When the cost on the flyer states $25/rider- this means both the sorter and the gate pay the $25 – that's $50 per team. You can ride up to 5 times in a class (5 different teams) There is also a $3 sanctioning fee per rider per team at any RSNC Sanctioned event. So, in this case, if the class is $25/rider and you add the sanctioning fee it is $28 per rider per team. I joined as a Beginner and had a free membership because I am new to RSNC. When will I need to renew my membership? As long as you remain a Beginner, you will not need to renew your membership. Once you move up to a higher division your membership will remain current through the RSNC National Finals of the current year but will need to renew your membership immediately after the National Finals event ends (usually in July each year) since our membership runs June to June, national finals are in June. To renew your membership you may choose to either pay the annual $50 membership fee or bring a new contestant to ride at a show to receive your renewal for free. I am having a hard time understanding rules for AQHA/RSNC shows. If I am a #3 rider showing in the AQHA / RSNC Open class and have more than one horse riding AQHA Open then only the first round counts for AQHA on each of my horses. But then does that mean that the horse and round totals also would count with the handicap to get to RSNC final go? Also, how would you work AM. and Open classes for the same horse? Do you ride that combo horse and rider 2 times? The two classes that can be co-sanctioned with RSNC are the Open and the Youth. Amateur cannot be co-sanctioned. If you are an Amateur you can ride your horse in both the AQHA Amateur and co-sanctioned RSNC/AQHA Open. In the AQHA /RSNC Open class, you can enter RSNC with a maximum of 5 rides just like always. It doesn’t matter what horse you ride. If you also want to enter the AQHA Open class then you designate the teams and horses that will be AQHA. Your AQHA partners for you and your horse or horses also must be entered with you as an AQHA team. To clarify, both you and your partner must be entered in the AQHA open class together. When that team makes their run in the RSNC/AQHA class then your 1st round time at 60 seconds will determine your AQHA placing. The remainder of your handicap time (if any) and the final round or rounds will determine your RSNC placing. When the run is complete the timer will announce the RSNC time and then back the lap timer up to the last time before 60 seconds and read the AQHA time. It is an opportunity to pay less of an entry fee for 2 separate classes and it allows you to place in both within the same class. AQHA/RSNC co-sanctioned event allows the producer to draw contestants from both organizations and allows contestants to save money while qualifying for the huge payouts at the RSNC National Finals and the AQHA World Show Finals. Until rules are unified AQHA rules will be followed on co-sanctioned classes. A note to Producers, AQHA does have 120 day application deadline so be sure to plan ahead and contact AQHA 806-376-4811or email Lisa Pond at LPond@aqha.org to request a Special Event Application. With AQHA Partner Alliance Status the 4 RSNC Regional Super Sorts and RSNC National Finals will be Double AQHA point classes giving everyone a huge head start on their qualification process. This is a win/win for all involved and especially for the sport of Ranch Sorting. If you have questions, contact the RSNC office at: info@rsnc.us or call 970-897-2901. How do I become a RSNC Judge? 2. Send in your $25 Judge's Membership fee (only if you are not a current RSNC member),by check made to RSNC or make payment on the online store. 3. You will be notified within 2 weeks of your results of your test and your information will be posted on the RSNC Approved Judge's list on the RSNC website. What are the different Ranch Sorting Classes and who can ride in them? One (1) additional second is given for every number a team’s combined rating falls below the class number. For example, a #3 rider and a #5 rider have paired to ride in the #13 which will be run on a 60 second clock. Their team rating is 8 (3 + 5 = 8); therefore, they will receive five (5) additional seconds (13 – 8 = 5). This team will sorton a 65 second clock (60 + 5 = 65). After the run, those additional seconds ARE SUBTRACTED from the final time. So, if the team sorted 5 head in 63.5 seconds, they turn-in a 58.5 on 5 head (63.5 – 5 = 58.5). In the All-Levels Handicap, the maximum team rating is 18 (a pair of #9 riders). So you could think of this as a #18 Handicap class. Therefore, a team receives one (1) second for every number their rating is below 18. This means that if a #6 rider and a #2 rider pair in the All-Levels Handicap which is being run on a 60 second clock, that team will receive 10 additional seconds (6+2=8) & (18 – 8 = 10) – 10 = 58); they will sort on a 70 second clock. If the team sorts 9 head in 68 seconds, they will turn-in a 58 on 9 head (68 – 10 = 58). In the #14 Ranch Hand Handicap, the maximum combined team rating is 14. The Sorter/Gate Rider must be designated. The Gate Rider may not sort or turn toward a cow to take it out the gate. He can go in the sorting pen to turn back cattle. One (1) additional second is given for every number a team’s combined rating falls below the class number For example, a #3 rider and a #5 rider have paired to ride in the #14 which will be run on a 60 second clock. Their team rating is 8 (3 + 5 = 8); therefore, they will receive six (6) additional seconds (14 – 8 = 6). This team will sort on a 66 second clock (60 + 6 = 66). After the run, those additional seconds ARE SUBTRACTED from the final time. So, if the team sorted 5 head in 63.5 seconds, they turn-in a 57.5 on 5 head (63.5 – 6 = 57.5). In the #11 Ranch Hand Handicap, the maximum combined team rating is 11. The sorter can not rated higher than a #4 because there is a 4 cap on the sorter. Therefore the highest rated rider a #4 could be partnered with is a #7. The Sorter/Gate Rider must be designated. The Gate Rider may not sort or turn toward a cow to take it out the gate. He can go in the sorting pen to turn back cattle. One (1) additional second is given for every number a team’s combined rating falls below the class number for example, a #3 rider and a #5 rider have paired to ride in the #11 which will be run on a 60 second clock. Their team rating is 8 (3 + 5 = 8); therefore, they will receive three (3) additional seconds (11 – 8 = 3). This team will sort on a 63 second clock (60 + 3 = 66). After the run, those additional seconds ARE SUBTRACTED from the final time. So, if the team sorted 5 head in 60 seconds, they turn-in a 57 on 5 head (60– 3 = 57). If a #14 RH Handicap class is offered, the #11RH Handicap should have a #4 cap on the sorter. If there is not a #14RH HC on theschedule,it is not necessary to cap the sorter in the #11 RH HC. In the #11 Rookie Handicap, the maximum combined team rating is 11. The sorter can not rated higher than a #2 because there is a 2 cap on the sorter. Therefore the highest rated rider a #2 could be partnered with is a #9. The Sorter/Gate Rider must be designated. The Gate Rider may not sort or turn toward a cow to take it out the gate. He can go in the sorting pen to turn back cattle. One (1) additional second is given for every number a team’s combined rating falls below the class number for example, a #2 rider and a #6 rider have paired to ride in the #11 which will be run on a 60 second clock. Their team rating is 8 (2 + 6 = 8); therefore, they will receive three (3) additional seconds (11 – 8 = 3). This team will sort on a 63 second clock (60 + 3 = 66). After the run, those additional seconds ARE SUBTRACTED from the final time. So, if the team sorted 5 head in 60 seconds, they turn-in a 57 on 5 head (60– 3 = 57). In the #10 Beginner Ranch Hand Handicap, the maximum combined team rating is 10. The sorter can not rated higher than a #1 because there is a 1 cap on the sorter. Therefore the highest rated rider a #1 could be partnered with is a #9. The Sorter/Gate Rider must be designated. The Gate Rider may not sort or turn toward a cow to take it out the gate. He can go in the sorti ng pen to turn back cattle. One (1) additional second is given for every number a team’s combined rating falls below the class number for example, a #1 rider and a #7 rider have paired to ride in the #10 which will be run on a 60 second clock. Their team rating is 8 (1 + 7 = 8); therefore, they will receive two (2) additional seconds (10 – 8 = 2). This team will sort on a 62 second clock (60 + 2 = 62). After the run, those additional seconds ARE SUBTRACTED from the final time. So, if the team sorted 5 head in 58 seconds, they turn-in a 56 on 5 head (58– 2 = 56). In the Beginner Sort, the maximum combined team rating is 2. Both team partners may only be rated as #1 Beginners. Both Team partners are aloud to switch back and forth between the sort and gate positions. The Gate Rider may not sort or turn toward a cow to take it out the gate. He can go in the sorting pen to turn back cattle. In this class the team will be sorting with 6 head of cattle (5 numbered and 1 blank). There is no handicap, therefore the team will be running on a 60 second clock. #10 Beginner Youth Ranch Hand Handicap (1 cap on sorter age 13 & under; gate rider may be an adult or an experienced rider). In the Beginner Youth Ranch Hand Handicap, the maximum combined team rating is 10. The sorter can not rated higher than a #1 because there is a 1 cap on the sorter, they also must be age 13 and under. The gate rider may be an adult or an experienced rider. The highest rated rider a #1 could be partnered with is a #9. The Sorter/Gate Rider must be designated. The Gate Rider may not sort or turn toward a cow to take it out the gate. He can go in the sorting pen to turn back cattle. One (1) additional second is given for every number a team’s combined rating falls below the class number for example, a #1 rider and a #7 rider have paired to ride in the #10 which will be run on a 60 second clock. Their team rating is 8 (1 + 7 = 8); therefore, they will receive two (2) additional seconds (10 – 8 = 2). This team will sort on a 62 second clock (60 + 2 = 62). After the run, those additional seconds ARE SUBTRACTED from the final time. So, if the team sorted 5 head in 58 seconds, they turn-in a 56 on 5 head (58– 2 = 56). In the Beginner Youth Division, or any other division, if the gate rider is not charged an entry fee, then the $3 Sanctioning Fee is not required. Points will not be distributed as well. If the $3 Sanctioning Fee is charged then points will be awarded. In the #4, the maximum combined team rating is 4. The highest rated rider that can ride in this class is a #3 rated rider partnered with a #1. Both Team partners are alowed to switch back and forth between the sort and gate positions. The Gate Rider may not sort or turn toward a cow to take it out the gate. He can go in the sorting pen to turn back cattle. There is no handicap, therefore the team will be running on a 60 second clock. In the Sadie Hawkins Handicap, the maximum combined team rating is 12. The team must be a male/female team. Both Team partners are allowed to switch back and forth between the sort and gate positions. They are to sort the cattle in numerical order starting with the number they are given when crossing the start line. Then at approximately half way through their run they are to go retrieve the cattle already sorted and sort them back in reverse order to the original side they started on. Only the cattle sorted back to the original side are counted as sorted cattle. For example they may sort 5 head the first way but only get 3 head back to the original side. In this example they would get a time on 3 head. If any cow crosses either way out of order it is a no time. I am planning on competing as a Beginner for the first time at an RSNC event next weekend. Can I only enter the beginner class? As a Beginner you pretty much have open range to enter all classes, although for the Youth class you have to be 18 and younger and for Masters class you have to be 50 or older. If it's a number class such as the #8 HC (handicap)- the combined rating between you and your partner must not exceed that number class, in this case it is 8. So, if your rating is a 1 you can ride with a partner that has a rating up to a 7. But let's say your partner is a 2, that would make your combined rating a 3 and the difference is your handicap, which would be 5. You always get 60 seconds to sort your cattle but if it is a handicap class you get to add your handicap in seconds. So now you have 65 seconds to sort your cows. After you are done sorting, your handicap time is removed from your final time. So, say you got 6 cows sorted in your 65 seconds, but your last cow came through at 55 seconds, we then minus your HC time of 5 seconds, so your final calculated time would be 6 cows in 50 seconds. If it is a Ranch Hand class that means only one person can sort and only one person can work the gate. The Rookie #11 HC has a 2 cap on the sorter. So only a #1 or #2 rated rider can sort but the gate can be worked by a higher rated rider. How do you determine what a rider needs to be rated and when will their rating be moved? Important Rating Guidelines – It is important to the success of this association to assure there is a place for new novice riders to be competitive within our sport. The definitions of the #1,#2 and #3 ratings are printed for all contestants to review so it is clearly understood that if you are successful at the #1 or #2 rating you will automatically be moved. This is the only way for new contestants who were just like you when you started to have a fair introduction to the sport. This rating is only for those participants who are novice riders on novice horses and who have never won 3 checks or over $500 in any sorting or other cow horse competition. Once you win 3 average checks or $500 (excluding youth checks) you will automatically be moved to a number 2. This is only an introductory level and is probationary meaning if you or your horses skill dictates it you may be moved at any time. The #2/Rookie rating is only for those participants that have never been rated higher than a #1 in any sorting or other cow horse organization. To start at a #2 rating this rider must be a novice rider on a novice horse who has never won over a $1000 in any sorting or other cow horse competition. Once a #2/Rookie’s earnings in RSNC sanctioned events reaches $1000 (youth classes excluded) and that amount has been confirmed and recorded at the RSNC Headquarters, he/she will no longer be eligible to ride as a #2 Rookie unless their win/loss ratio is below a .60 in the #6 and below divisions. Then they will remain a #2 until they earn another $500, at which time they will be reevaluated for the .60 cut off, and if not above that ratio again at every $500 interval. They will remain a #2 until they surpass the .60 win/ loss ratio at which time they will automatically move up to a #3 novice. This is a probationary rating meaning if you or your horse’s skills dictate it you may be moved at any time. If you have success please expect to move beyond the rookie rating. A #3 Novice is defined as a #3 rated contestant that is inconsistent in their ability to sort cattle whether it is because of their cattle reading ability, their ability to get successful partners and/or the ability of their horse. Any new member that has won over $1000 in Ranch Sorting or other cowhorse competition in any and all associations combined will not initially be rated below a #3 Novice. Additionally the #3 rating will be reviewed by win/ loss ratios every 6 months (after the World Finals and State Finals). If a #2 has been moved to a #3 they will have the opportunity to move back to a #2 after reevaluation at every 6 month interval. If they have attended enough events to fairly evaluate them and their win/loss ratio is below a .25 as a #3 they will have the option to move back to a #2. An Amateur is defined as a #4, #5 or #6 rated contestant that is just below or just above average in their ability to sort cattle. This is a contestant that can read cattle, is aggressive and confident and is riding an athletic cow horse. From time to time this contestant or their horse will make minor errors that prevent them from consistently sorting. Those that are considered just below average should be a #4, average as a #5, and just above average should be a #6. An Open Rider is defined as a #7, #8 or #9 rated contestant that excels within the sport of Ranch Sorting. These are experienced sorters that have continued to improve and advance within the rating system or professional horseman that have recently entered the sport and their horses and sorting abilities dictate that they are superior to the Novice and Amateur contestants. These could be cutting horse and cow horse trainers that in a very short period of time have learned how to be competitive in sorting and have advanced to the open level. There are three levels within the open division. Data Driven Rating Evaluation is the contestant’s data and will be collected and carried over from one year to the next, until as determined by RSNC he or she has competed enough to accurately depict a contestant’s performance. Once data is used to depict a contestant’s performance, then the slate is cleared and data is collected again until a rating evaluation is determined. The RSNC will use 9 rating classifications. All contestants regardless of age, will be assigned a rating classification. Each new member of RSNC must be given a rating classification before competing in a RSNC sanctioned event. The member is required to accurately and honestly answer all questions regarding his or her rating criteria. New Membership Probationary Rating is where all new members will compete on a probationary rating for their first year of competition. If for any reason, it is found by RSNC that the person is inappropriately rated then RSNC will correct the rating. If that person is found to have falsified information about his or her rating then RSNC may revoke the membership of that person. Masters – The Masters division is for all contestants ages 50 years or older by December 31 of the current year. Youth – All Contestants in the Beginner Youth Division must be 12 or younger by January 1st of that year. Beginner Youth may have an Adult or experienced person in the gate but the sorter must be rated #1 Beginner. All Contestants in the Youth Rated Division must be 18 or younger by January 1st of that year. There is no rating cap on the Youth Rated Division but it is recommended to be a HC class. Youth ages 13 through 18 who are rated 4 & under may ride in the Rated Youth class but are not eligible for youth points. The Youth Points Race is for all youth age 12 & under as of January 1st of the current year and rated a #4 or below. The youth points race includes all youth classes and all RSNC classes with a class cap of 11 or lower, excluding the #11 Handicap. Youth will not be moved from a #2 to a #3 unless their win/loss ratio is in the top 60% of all youth when they reach the $1,000 mark or until they reach $1,500 in regular rated classes in the top 60%. In which timeframe do I earn National Points? National Points are earned from June to June. National Finals are held in June. The Top 20 from each rating category from each state that have ridden at 5 sanctioned RSNC Events qualify for high point prizes. There is a 5 show requirement for all riders that wish to attend the National Finals event, however, first year members are exempt. In which timeframe do I earn State Points? State Finals are usually held the end of December or first part of January. The top 20 from each rating category of their state that have ridden at 5 sanctioned RSNC shows. I am a current RSNC member, why am I not seeing my points on your website from the show I rode at last weekend? It may be that the show you rode at has not been received and processed at our HQ office yet. Producers have 10 days to send us their show information. To check to see if the show you rode at has been added to the points races click on the link that says "Click Here" to see what shows are included in this posting" that is located on each of the points pages above the US map. Why am I not seeing my Masters points that I have earned in the points races on the website? Masters points earned will not show on the points race pages unless the RSNC HQ Office has a date of birth on file for contestants. If you do not see your Masters points listed, please contact our HQ office at #970-897-2901. Why am I not seeing my Youth points that I have earned on the website? Youth points earned will not show on this page unless the RSNC HQ Office has a date of birth on file for youth contestants. If you do not see your youth points listed, please contact our HQ office at #970-897-290. How does a Round Robin class work? A Round Robin is where each rider rides with every other rider one time. Each rider accumulates the number of cattle sorted on each team he or she is on and at the end, the rider with the most cattle sorted in the fastest accumulated time wins. How are points awarded in Round Robin classes? a.) Points are awarded to the top teams in the class just like in any other sanctioned class. Not the winning individuals. Therefore in your example with 20 riders you will generate 190 teams. Based on 190 teams 1st thru 10th will get double points because there are over 100 teams in the class.1st 18 pts., 2nd 16 pts., 3rd 14 pts., etc., and 10th 1pt. Is there an adjustment of the top riders Round Robin rating, if the earnings are above the required earnings rule? 1st place $1680, 2nd place $1260. Rider ratings are only adjusted after completion of each Round Robin by the RSNC when the summary report is submitted to the National office. They are not adjusted at the show. Will each RSNC Round Robin qualify the rider for the requirements of participation in an sanctioned RSNC show ? If a producer offers a Round Robin for upper level and a separate Round Robin for lower level contestants on the same day, it will qualify as a sanctioned event. Why does RSNC not post a complete list of ratings for their riders? We have spent several hundred thousand dollars creating a software program and office database to track win loss ratios so we can offer our contestants a fair rating system. We did this because of the success that USTRC had with a similar program in Team Roping. They told us that our rating system would become the most valuable asset we have and that we should take precautions to protect it. I am confident that they were correct. Because of the growing popularity of the sport there are now many new organizations trying to pop up and use not only our rules but also our ratings. If we were to post all ratings on a spread sheet it would be an open door for more of that to happen. Any one can call our office and ask for individual ratings or go on the web site and look at the points races to get a good idea of ratings in any given state but unfortunately, for the protection of our investment we cannot list all ratings.